If you are looking for the most fab property in the most delightful setting, then these are the cottages for you. Set in the heart of the most idyllic village with the beach on your doorstep, and the most fantastic walks close by. After spending a day out to return to these georgous surroundings with wonderful gardens to sit outside and have a glass wine will make your holiday complete. We have just returned from our third visit to both the Farmhouse and the barn, and can't wait to return. We had the most wonderful stay at the barn, aside from the fact that we got engaged on our trip to croyde, the barn was perfect. New, clean, great location, quiet with everything you need. We really didn't want to leave and are looking forward to our next trip. You won't regret choosing this place! The pictures don't do it justice! We have had the privilege of staying in The Barn and The Farmhouse for New Year for two years running. Both properties are of high standard. Both spacious modern clean and comfortable. Downstairs everything has been thought of, the kitchen has everything you need and more, the living room has an open fire which was a winner for us, even books and cd's. Up to date television on the wall and internet access. Upstairs is the same with clean, modern decor and high standard bathrooms, the beds are comfortable and plenty of wardrobe and drawer space. We have enjoyed lots of holidays in Croyde and feel that this is our favorite accommodation, it is in the heart of a friendly village, the pubs are all nice (we like the Manor for a family meal) the beach is a pleasant walk away, lots of other walks to try (the walk to Putsborough Beach is lovely). The parking is easy and convenient with nice gardens. 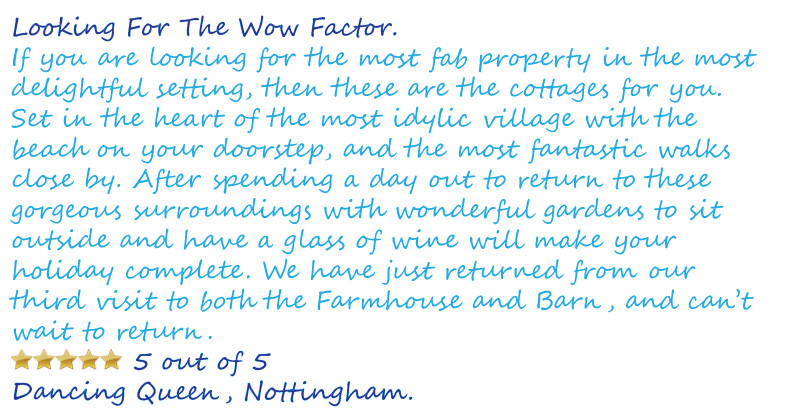 The listing description was very accurate and we feel very fortunate to have found such an ideal cottage. We have a young family, but would recommend the property to anyone and everyone who could appreciate the the cottage and it's surroundings. The Barn is a wonderful property with the benefits of being in the centre of Croyde made our stay extra special. The lovely welcome pack was very good and the Kitchen is a wonderful social area. Would love to return in the future and would recommend anyone to stay and enjoy the lovely surroundings and atmosphere. Well worth the 5 star rating given. We stayed in the "Barn" for two nights in April for a surfing weekend in Croyde. We were delighted with the house throughout, which was easily able to accommodate our group of six twenty-somethings. Everything from the advert rung true for us. Having stayed in a few other places nearby, the standard of the Barn was very high; well finished, maintained and very clean. We couldn't believe our luck when we walked in the door! The location was ideal for us, easily within walking distance to the beach, shops and pubs. There was also plenty of parking. Certainly our first choice for our next trip!